They are a large duck, with the males about 76&nbsp;cm or 30 inches long, and weighing up to 7&nbsp;kg or 15 pounds. Females are considerably smaller, and only grow to 3&nbsp;kg or 7 pounds, roughly half the males' size. The bird is predominantly black and white, with the back feathers being iridescent and glossy in males, while the females are more drab. The amount of white on the neck and head is variable, as well as the bill, which can be yellow, pink, black, or any mixture of these. They may have white patches or bars on the wings, which become more noticeable during flight. Both sexes have pink or red wattles around the bill, those of the male being larger and more brightly colored. 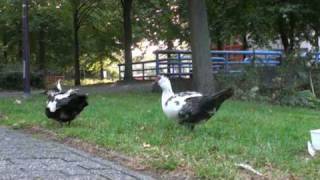 Although the Muscovy duck is a tropical bird, it adapts well to cooler climates, thriving in weather as cold as −12°C and able to survive even colder conditions. In general, Barbary duck is the term used for ''C. moschata'' in a culinary context. 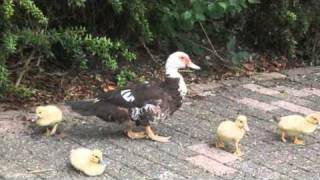 The domestic breed, ''Cairina moschata forma domestica'', is commonly known in Spanish as the ''pato criollo'' . They have been bred since pre-Columbian times by Native Americans and are heavier and less able to fly long distances than the wild subspecies. Their plumage color are also more variable. Other names for the domestic breed in Spanish are ''pato casero'' and ''pato mudo'' .